The Banded Lapwing (Vanellus tricolor) is a small to medium sized wader which belongs to the plover family. It is found over most of Australia and Tasmania - though is absent from the northern third of the continent. 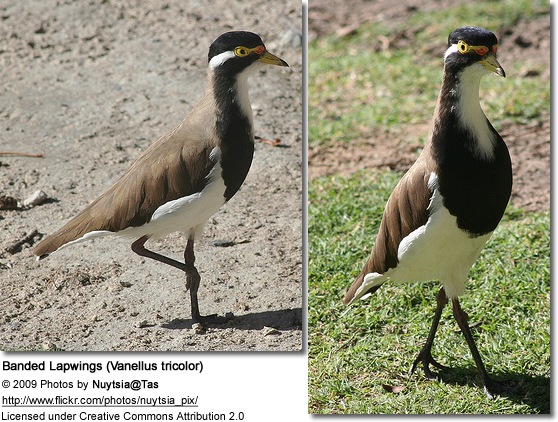 There are two species of Lapwing in Australia and one subspecies, the other is the more common Masked Lapwing which is split into Vannellus miles miles and Vanellus miles novaehollandiae. The Banded Lapwing is the less common of the two species of Australian lapwing and is also less conspicuous, it inhabits open spaces with short grass, or stubble. Nests on ground in shallow scrape lined with small stones, twigs or animal droppings. Banded Lapwings are characterised by their black cap,white ear-stripe and black band around breast with white throat and 'bib'. Eye is yellow and is encircled by a fleshy yellow ring, a small red wattle lies at beginning of yellow bill. Wings are brown, underbelly is white and legs are red. Voice is a loud "er-chill-chaar-char".